Arsenal took on Reading in their EFL Cup fourth round tie and they came out stronger in the opening exchanges but it took well over half hour mark for Arsenal to finally take the lead. It was Alex Oxlade-Chamberlain who bambozaled Reading defense with his superb run from the right flank and unleased a low hard finish at the far post to put Arsenal in lead. Reading however did not crumble and stayed in the game for most part. 34′ 1 – 0 Alex Oxlade-Chamberlain scored with a superb low finish at the far post after incredible run on the right flank. 78′ 2 – 0 Alex Oxlade-Chamberlain scored again late into second half to secure quarterfinal berth for Arsenal. Arsenal vs Reading has been a very common fixture in both League Cup and FA Cup as far as the recent history is concerned and their most recent meeting was back in April 2015. 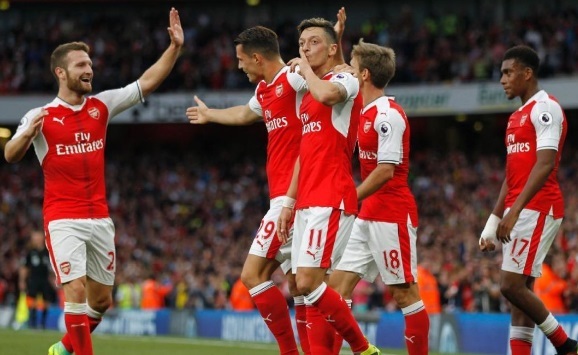 Arsenal are undefeated in their recent 8 competitive games and although Arsene Wenger is expected to make several changes in the starting lineup Arsenal are odds on favourite to qualify for the quarter finals of this year’s EFL Cup. Team News & Lineups: Arsene Wenger is expected to make several changes in the starting lineup for tonight’s clash with most notable inclusion coming in Arsenal top scorer in recent seasons Olivier Giroud. He has made a relatively slow start due to post Euro lack of match fitness and minor injuries and he will be hoping to get his season back on track with a good performance. Match Predictions: The kind of form Arsenal are at the moment its hard to see Reading getting anything in this game but looking at the previous history we can expect goals in this one. Remember that 7-5 win for Arsenal in this competitive a few years back ? Reading found themselves 4-1 up before Arsenal mounted a massive comeback winning the game 7-5 making it the highest scoring game in League Cup history.